When it comes to massage therapy continuing education, you want to be sure the time and money you invest will yield rewarding returns. Those manual therapists who choose to pursue advanced training with Erik Dalton can be confident in the knowledge that Dalton has been practicing and teaching for more than three decades. A well-known name in the field of non-invasive pain management, Dalton has developed a stellar reputation as a practitioner and as an educator. It’s important to know the background of the person who created and is teaching your next CE course, as this will have a significant impact on the quality of the training you receive. Take the time to read more about Dalton’s deep roots in the field of manual therapy, from his early work as Certified Rolfer to his development of Myoskeletal Alignment Techniques to better help people in pain. Confidence in the knowledge and experience of the person who designed and is teaching your next massage therapy continuing education class is the first step toward getting a great return on your investment. After all, the goal of taking these classes — particularly the ones that teach hands-on techniques — is to secure some of that knowledge and experience for yourself and your clients. With Erik Dalton’s CE programs, the overarching theme is manual therapy for pain management. Dalton created Myoskeletal Alignment Techniques, called MAT for short, in his quest to help the large number of people who suffer with all kinds of chronic pain. Tapping into evidence-based insights from fields such as osteopathic medicine and neurology, Dalton created a modality that allows manual therapists to give their clients lasting relief from chronic pain. MAT seeks to address the source of the pain problem, rather than simply chasing down the symptoms. With training in MAT, practitioners can offer their clients the in-demand service of effective pain management that’s both natural and non-invasive. Given the need for these skills among a population that’s plagued with chronic pain, it’s no surprise that a Certified Myoskeletal Therapist can expect to see a bump in new clients, repeat clients, referrals and overall income. Upon completion of a MAT massage therapy continuing education course — whether it’s one of Dalton’s online CE classes, home-study programs or in-person seminars — students will receive the official credential of Certified Myoskeletal Therapist. The diploma you receive after finishing a MAT massage therapy continuing education course also will show the title of the course itself, such as “Upper Body,” “Treating Trapped Nerves” or any of the other numerous e-learning or home-study CE programs Dalton currently offers. Each certification and diploma will convey to prospective clients and employers that you are gaining more and more expertise in non-invasive pain management. 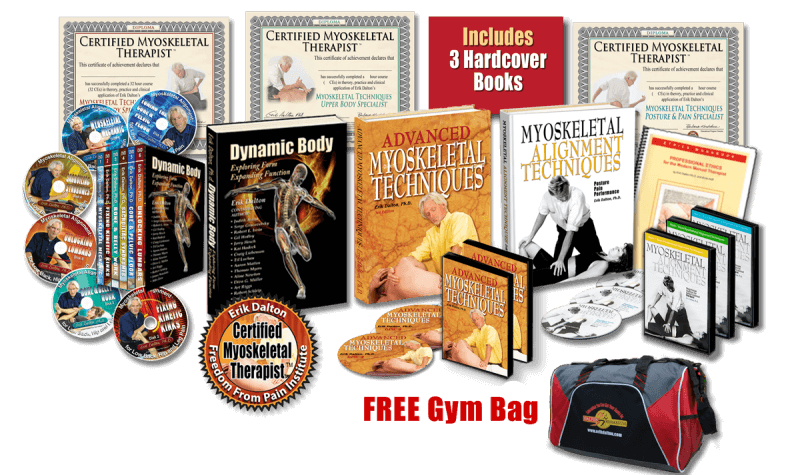 Once a practitioner has completed all four MAT foundational home-study courses, along with the five additional MAT CE programs offered via online classes and home-study packages, plus 50 hours of live myoskeletal workshops, that practitioners will receive the elite credential of Master Myoskeletal Therapist, or MMT.